The media presented the protests as the revolt of democratic-spirited youth against the increasing authoritarianism of the government, with the erupting violence as proof of this inclination. The fact is that the overwhelming majority of society, including government officials and the ruling party, heavily condemned the disproportional use of police force. Indeed the Prime Minister initiated a process of inquiry for the excessive use of the force and tear gas. The central pillar of the arguments, which focuses on putting the government on the anti-democratic side of the polarization, claims that, during the Prime Minister Erdogan government’s decade in power, Turkey has witnessed a steady erosion of rights and freedoms, or that Erdogan is becoming increasingly authoritarian. This ignores the fact that Erdogan came to power during the February 28 Process, which was initiated and guarded by the military after the forceful resignation of the popularly elected legitimate government in 1997. The period between 1997 and 2002 had witnessed gross violations of human rights and almost a total collapse of Turkey’s economy. Indeed, contrary to what the ads published by the major U.S. newspapers claim, during Erdogan’s governments these violations were gradually removed. As part of the EU accession process, Turkey has passed many democratic reforms, one of which is the February 12, 2010 referendum that removed the restrictive articles of the 1982 Constitution passed under the military’s tutelage. Before the AK Party came to power, a Kurdish citizen in prison was not allowed to speak with his mother in Kurdish even though his mother could only speak in Kurdish. The recent constitutional amendments made the banning of political parties almost impossible. The process of democratization is an earnest agenda in the current government. There are ongoing efforts to replace the current 1982 Constitution dictated by military junta with a more far-reaching and democratic one. The Kurdish problem, stemming largely from the nationalistic ideas crafted during the country’s formation, is being underway for a permanent peaceful solution. Since the Peace Process was put into effect five months ago, there have not been any major clashes causing human casualties. Whereas Turkey’s politics were formerly equated with torture, extrajudicial killings and politically motivated murders, this legacy’s stain on the country’s reputation has nearly disappeared alongside the Erdogan government’s efforts to purify the system of its state-connected networks of crime. Rather than inclining to authoritarianism and exclusionist policies, Prime Minister Erdogan rejected the former Republican elite’s rejectionist understanding of national unity, which promoted a constructed secular Turkish identity while denying the plurality of cultural identities, and the validity of any alternatives to the official discourse of the state elite. The physically-enforced and latently-promoted efforts to deny and rid society of traces of different ethnicities and lifestyle values are part of the segregation and cultural elimination practices of an exclusive approach to citizenship. Many of the supremacist attitudes and values associated with racism in the US can be found among the Turkish circles influenced by a hard-core secularist-nationalist worldview when it comes to their treatment of, and outlook on, people who identify with religion as a lifestyle and/or with a minority ethnic group. The attacks on Erdogan, stemming from these ideologies, even before his becoming Prime Minister can be compared to racist attacks on Obama. Despite the strong presence of these groups, within the last decade, all cultural and ethnic identities and political ideas have finally found acceptance in Turkey. Nowadays, there is much talk about the imprisoned journalists in Turkey. In fact, it is impossible to point to any member of the press from any established media organ who is imprisoned for opposing or criticizing the government. Among the media outlets currently operating in Turkey, you can even observe those which, without being subject to any punishment, openly accuse the government of being a traitor and of serving the interests of outside forces, mainly the U.S. Those oft cited imprisoned journalists are not in prison for what they have written, but for other violations of the law which is aligned with the “war on terror” mentality which dominates a great proportion of the globe nowadays. It is expected that the progress achieved in the Kurdish Peace Process and the new constitution being drafted will eliminate these restrictive laws. The accusations regarding women’s rights (i.e. productive rights) and alcohol sales are also baseless. In comparison to the developed world, Turkey had nearly meaningless regulations on alcohol and abortions. When compared to US standards, Turkey’s new abortion law is more lenient, and its alcohol law is not more restrictive. 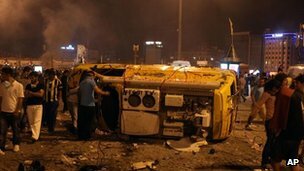 It is only possible to read the violent protests in Turkey over the course of the past week as the conflict between revolutionary democratic youth and an authoritarian government if one ignores the background provided above. The second mistake is to assume that everyone who joined these protests was motivated by democratic ideals. In fact the majority of the original protestors stopped joining the protests after the protests were hi-jacked by extreme leftist and ultra-nationalist groups, which despise the expression of any minority identities in Turkey. Some elements within the main opposition party supported these protests because they considered it an opportunity to weaken the government. Every Turkish citizen has the obligation to be concerned about the disproportionate force used by security personnel. Each Turkish citizen has the right to demand a free and unbiased media. However, it is also our obligation to be truthful about the facts of the country, which has experienced four military coups against the popularly elected governments between 1960 and 1997 under the guise of the “legacy of Ataturk,” which has only served as a cover for the long-standing authoritarian practices.